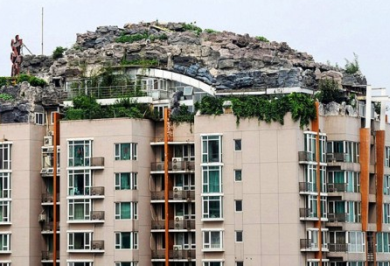 On a Monday morning in August 2013, officials from Beijing’s Urban Administrative and Law Enforcement Bureau gave Beijing resident Zhang Biqing 15 days to demolish a mountainous two-story villa he had built on the roof of his 26-story building. The word “mountainous” is used in the literal sense. The eccentric Millionaire who made his fortune having founded a national chain of acupuncture clinics, spent six years working on his bizarre project. Real grass trees and rocks were used to cover the entire 1000-square-meter surface to create a monstrosity of a structure which essentially resembled a tall building with a mountain plonked on it. In Beijing it is not uncommon to proceed with construction projects having not received official government approval, this dispute however came to a head as a result of ongoing complaints from residents who had to endure it. It was reported that occupants who issued the complaints suffered years of harassment before the matter was finally put to rest. Living in the 26th floor penthouse and were his upward renovation to have stood, Biqing would have afforded himself the luxury of a mountain getaway without having to suffer the rigors of a Beijing commute. According to Google Sightseeing the city is the worst in the world for traffic congestion so albeit that it was undoubtedly ill-conceived, perhaps his logic wasn’t entirely balmy.